Howard Bald led trips into the backcountry. About the middle of that first decade of the century , an occasional automobile would appear in Ojai. Naturally there was some friction between auto drivers and horsemen. Generally, the automobile people were quite understanding and would often pull to the side of the road, shut off the motor and even lead a fractious horse past the auto. One farmer had quite a smash-up. The motorist went to his assistance and did all possible to straighten things out, but the irate farmer was not satisfied and insisted on fighting. The motorist backed off, saying, “You don’t know me.” The farmer didn’t care who he was and kept advancing and swinging. Finally, the motorist struck one blow and the farmer went down in a heap. That motorist was Joe Rivers, a world-famous prize fighter of that day, who was training at Wheeler’s Hot Springs. He fought several battles with Ad Wolgast, who held the crown, but just didn’t make it. The Pierponts were among the first of that day to have an auto. Phil and Austin came bowling down Ojai Avenue looking neither right nor left. Fred Houk and I were riding up on horseback, and our horses shied off the road at their approach. I don’t think we were much inconvenienced, but we were incensed at being “run off the road” by those “stuck up so-and sos.” We turned about and galloped into town, vowing to show them a thing or two. We were doubtless relieved when arriving to find that they had not stopped and were probably headed for Ventura. Phil, Austin and I have had some good laughs over it. I can’t refrain from relating one more horse-auto episode, even though it occurred in the middle of the second decade [1910-1919]; and I am trying to confine myself to the first decade [1900-1909]. I bought a rather attractive colt for a few dollars, because of her questionable character. After several months of training and a little expense, she became quite a docile animal. I had an interested buyer who offered quite a substantial sum of money, considering what I paid for her. Before the deal was closed, I was riding up the upper Ojai grade with a young lady, when an auto crowded us into the bank and rammed into my colt. As a result, she developed an everlasting fear of the chugging monsters, and of course, ruined my sale. At the time, Earl Stanley Gardner was practicing law in Ventura (that was before he took up writing). 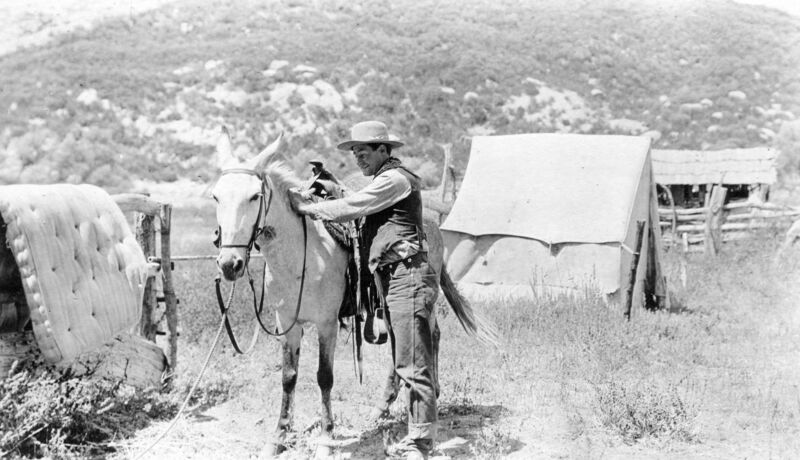 We had been on several expeditions in the Sespe and Pine Mountain country and had become quite friendly. When he heard of the incident, which was months later, he said, “Let’s sue them.” “Them” was the Bartlett Music Company. The trial that followed was one of the funniest events that was ever staged in Nordhoff [now Ojai]. Court was held in the rear of what is now Bill Burke’s offices [the Ojai Realty Company in the arcade], and Judge [Harrison] Wilson was on the bench. At times he was practically on the floor from laughter. The defense had gone to a great deal of expense and time, procuring evidence and witnesses to prove that the animal was a confirmed outlaw, and I was reputed to be the best rider in the county, that at one time I was unable to ride her, and that I paid only 37 dollars for her. My witnesses were winter tourists of the Foothills Hotel and Pierpont Cottages, who all volunteered their services. All of the defense witnesses’ testimony was really a help to me, and for the sake of brevity I will eliminate details; but Judge Wilson decided in my favor. Gardner would take no pay from me. He just had the satisfaction of beating Earl Moss, who was a young Ventura lawyer, not to be taken lightly. The Ventura newspaper (I don’t remember its name) gave the country boy [Howard Bald] quite a panning for trying to hog the road with old Dobbin [“the confirmed outlaw”]. I faintly remember the furor that went up at about the turn of the century over women riding cross saddle. My mother and aunts were among the first to change. The garb they wore was a long, voluminous, divided skirt, that reached almost to their stirrups. One prominent citizen threatened to take his wife and sister off their horses and spank them if he caught them riding “astride.” Our family had several side saddles around for years, but whatever became of them, I don’t know. They would be valuable antiques today.